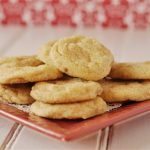 Do you have your favorite cookie recipes you make over and over again? Chocolate Chip and Snickerdoodles are the two at our house. They are the ones I make when I’ve got a craving for a cookie but I don’t want to have to think and I know I’ll have all the ingredients. These White Chocolate Snickerdoodles are a twist on the traditional. So to avoid being too boring I try to change it up a bit. I try adding something in that isn’t normally in the recipe. Sometimes it works and sometimes it doesn’t. I loved what happened when I added chocolate chips and toffee bits to the snickerdoodles – so good. So when I got a craving for snickerdoodles this last week I opened up my baking cupboard to see what I could add in. White Chocolate. Yes, I think everything tastes better with white chocolate. I love white chocolate chips in my chocolate chip cookies so why not snickerdoodle? Guess what? Snickerdoodles taste better with white chocolate! I loved biting into them and finding that little surprise of white chocolate. I think a batch of white chocolate snickerdoodles would be the perfect way to tell your Valentine you are thinking of them!! Who wouldn’t love some of these sweet treats wrapped in a cute little package for Valentine’s Day!? I used the unbleached natural waxed paper bags I found at Whole Foods. They are with the plastic wrap, sandwich bats etc. I topped it with a doily and then some baker’s twine. I used my “new” old typewriter to write a little Valentine note. A pretty and delicious Valentine gift. A twist on the traditional snickerdoodles - White Chocolate Snickerdoodles.Because snickerdoodles taste better with white chocolate! Cream butter, sugar and eggs together. Mix in flour, cream of tartar, soda, salt. Form dough into balls and roll in sugar/cinnamon mixture. Place 2 inches apart on cookie sheet. This cook time was NOT long enough. I made these a couple of weeks ago and they are so delicious!! Thanks for the recipe! I love your ideas and blog! I am following you on Pinterest for more ideas! Your banners! Snickerdoodles are my favorite! Snickerdoodles + chocolate, though?! Yum!! I love the idea of mixing in the white chocolate with the snickerdoodles. I agree… white chocolate can only make something better. These look great!